Clear Soups are known to be light, refreshing and soothing too. They are thin liquid soups made of water or stock, with crisp titbits of veggies or beans. Down with a seasonal flu or feeling drowsy due to cold, sip on the Mixed Vegetable Clear Soup made by simmering a wide range of vegetables in hot water. It is very easy and quick to make. To experience the magic of Indian Clear Soups, try classic recipes like spicy Rasam or Nourishing Moong Soup. Rasam is the homeliest South Indian recipe you could come across. The aroma of fresh roasted spices like cumin seeds, coriander seeds and pepper used to make various rasam like Dal Rasam, Garlic Rasam are helpful in chasing away the worst of colds! Have it steaming hot to free those horrid nose blocks too. A variation to the rasam is Kokum Saar. For mushroom lovers, there is Hot Mushroom Tea which is actually a clear mushroom soup. This soup is mildly flavored with pepper and requires just a handful of ingredients and can be made in just 15 minutes . Soups are light on stomach yet, filling. A meal of salad with a hot bowl of soup is perfect for people trying to lose weight and for anyone who is hungry but, doesn’t wish to have proper meal. Want a healthy protein rich soup, then opt for Moong Soup with paneer. It has a pleasing taste and will be loved by kids too. Also, the Vegetable and Basil Soup made using carefully chosen vegetables is diabetic friendly. Everybody loves Vegetable Clear Soup. How about substituting the normal vegetables with oriental veggies like broccoli and bean sprouts an addition of ginger and garlic, making this Chinese Vegetable Clear Soup a thorough example of Chinese cooking. Perhaps the most exciting aspect of this soup is the garnish of crispy rice, which lightens your heart and makes it jump delightfully. Almost synonymous with Chinese cuisine, the Wonton Soup is another sumptuous and tongue-tickling soup. We hope you enjoy our collection of Indian Clear Soups. 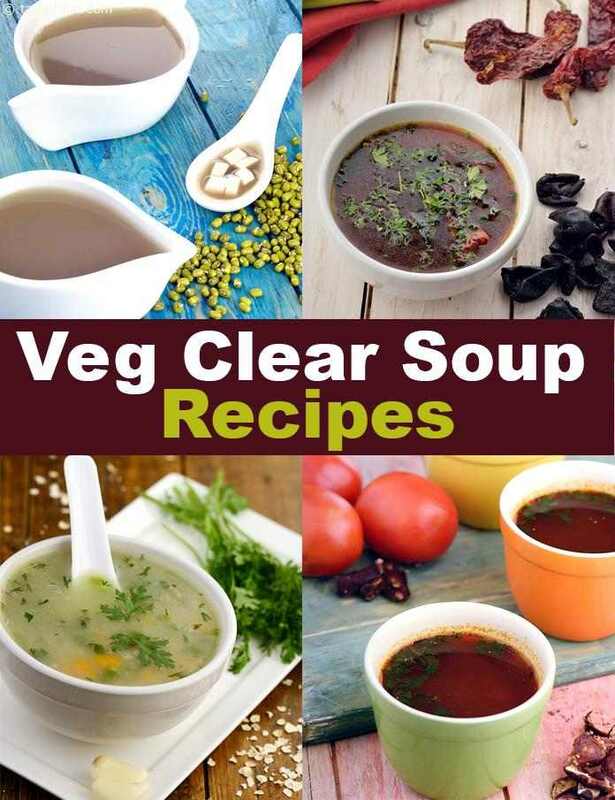 Given below are 48 clear veg soup recipes. A simple but spicy soup cooked "fat free". A thick sago soup flavoured with soya and lemon grass and cooked with carrots and onions.